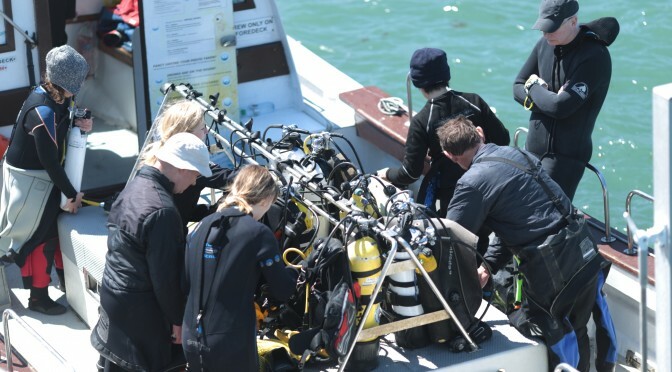 The club uses BSAC‘s training programme, which prepares divers for British and overseas diving. Once qualified, your BSAC qualifications will be recognised by dive operators worldwide. BSAC courses put a lot of emphasis on safety, and trainees build on their skills week on week. Training with the club, you will have the reassurance of diving with people you know. You will also have the opportunity to develop your skills and experience. If you already have qualifications from another diving organisation, we offer cross-over training to the relevant BSAC qualificaton. Contact us at argonautsmembership@gmail.com to find out more. If you haven’t dived before, why not contact us for a try dive? To take a training course, you need to be reasonably confident in the water and able to swim at least 200 metres. You also need to be able to attend the lectures and pool sessions, which are held by the club instructors on Tuesday evenings (from 6.30pm), and a weekend open water diving trip. We use the training pool at the Queen Mother Sports Centre, and an inland site such as Stoney Cove for open water training over weekends. We try to organise the sessions on consecutive weeks, so you can keep building on your knowledge from the previous week. But we’ll work with you to make sure you can make the sessions. One of the big benefits of BSAC is that training courses are run by the club members, so we can organise courses to suit our members. But please be aware that all our instructors are volunteers, and give up their time to run the training courses. We therefore ask that all trainees are committed to participating and attending the agreed training schedule. It’s essential that trainees attend every session. We will arrange the course with you at the beginning, based on all everyone’s availability. If for any reason you can’t make a training session, please give us plenty of notice. We’ll try and rearrange things, but occassionally, missing a session will mean that you’ll need to wait until we next run the course. Please note: If you want to learn to dive in a relatively short space of time, or if you don’t want to do your diving as part of a club, you’re probably better off learning with a BSAC dive centre. The next stage beyond Dive Leader is Advanced Diver. We organise extra training, including refresher sessions and a course on first aid for diving emergencies.